← Birthday Games From Long Ago – Good for Today! When my children were very young, we had lots of fun reenacting some of their favorite stories. We acted them out with the help of puppets and by playing the parts ourselves. There were three stories we especially liked. They all involved chasing each other around the house – great for rainy days. These are the three stories and how we did the play. It’s more fun when your child knows most of the words – we read the story many times before finally playing. I think everyone knows this story; at the end, the pool little gingerbread boy gets eaten by the fox! A word of warning, we first read this to our son when he was 2 or 3 years old. He cried. Better wait till they’re a little older and you can try to explain it away. Anyway, I made a gingerbread puppet by drawing and cutting one out of craft foam, then coloring it with sharpies. I glued it to a Popsicle stick and voila! As before, one child got to hold the gingerbread puppet and the other and/or myself would play the other parts with puppets, plush animals or by acting it out. Around the house we would run. When it came time for the gingerbread boy to cross the stream, we laid out a blue silk cloth, got down on our hands and knees and acted it out with the puppets. Craft foam, Sharpies and Popsicle sticks are great materials for making one dimensional puppets. Have you noticed a pattern? Our favorite stories all involve capturing and eating! Oh well, they make the games more exciting. When an acorn drops onto her head, Henny Penny decides the sky is falling and goes off to warn the King. Along the way she meets other birds who request to join her. Eventually they meet up with a fox. 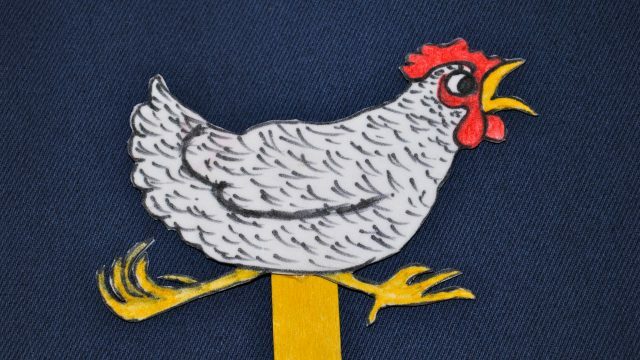 “Henny Penny” is the same story as “Chicken Little,” but with different character names and a more tragic ending – the chicken and her companions get caught in the fox’s cave and the foxes “still remember the fine feast they had that day.” When playing, we sometimes changed the ending so the dumb birds could get away and hopefully learn a lesson. For this game we used our trusty fox puppet and I made the rest of the characters out of craft foam, Sharpies and Popsicle sticks. I tried to copy Galdone’s illustrated characters the best I could; but it really doesn’t matter how you draw them, children are very forgiving. This game is different than the other two because instead of running, you march around the house. We didn’t do this but I think adding marching music might be a fun variation! The fox’s cave was under the kitchen table. I hope our pretend play inspires you to turn your favorite children’s stories into games! And if you like these books, remember to add them to your child’s giftsoc! They make great presents. Have fun!